Increasing reliance on composite and Web-based applications to implement mission critical and revenue generating services has had significant implications for both IT staff and business managers. IT's primary responsibility and ongoing challenge is to provide a reliable, high-performance composite application environment that ensures the end user's ability to successfully conduct business transactions while enabling IT to meet Service Level Agreements (SLAs). Anything less than a superior end-user experience and high service quality can have immediate consequences such as lost online revenue and reduced customer satisfaction. 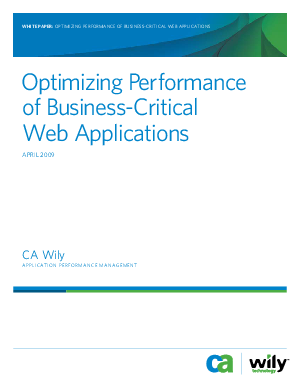 Adopting an effective application performance management strategy is a critical step in managing complex Web revenue and generating mission critical applications to deliver a high-quality end-user experience.